While waiting for the Cincinnati movement to come into clearer focus, Nast produced "The 'Liberal' Conspirators (Who, You All Know, Are Honorable Men)." The artist quotes from Shakespeare's "Julius Caesar," and it can hardly be an accident that this caricature was published in the March 16 issue, one day after the Ides of March. 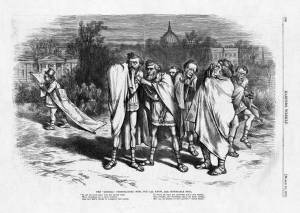 In this cartoon, the Liberals plot against the political life of Grant (as Caesar) and are considering the inclusion of Greeley (as Cicero), who wanders past the White House, absorbed in his Tribune and with a paper-"What I Know About Bolting"-in the pocket of his long, white coat/toga. Cicero was a Roman senator, orator, and enemy of Julius Caesar, but the other conspirators in Shakespeare’s play decided to leave him out of the plot.